I recently discovered Tricky Truck, thanks to RyLe, and I was stunned by the look of the shadows in this game. It seems that it renders shadows from multiples positions around the light and blends it, creating a nice, smooth, "ambient occlusion" styled result. It tried very quickly to write a small patch (currently < 50 lines) to see if it's possible to have this type of rendering, and here's the result of the first experimentation: http://ftp.cqfd-corp.org/too-slow-to-stay-shadows.jpg (sorry, too lazy to create a thumbnail for the picture). I'll try to push experimentations a bit further. Is it possible to highres shadowmap size to have sharpen shadow ? Is it easy to change this ? 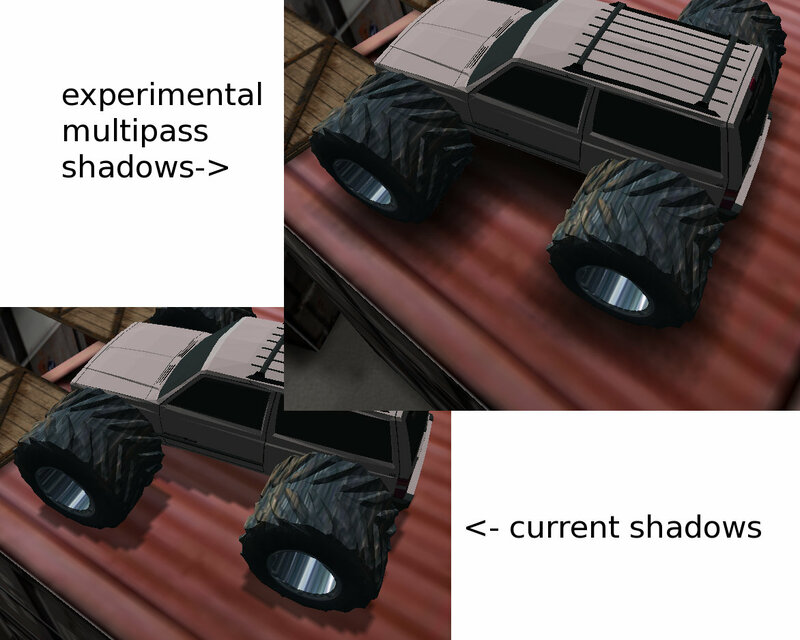 The shadow texture size is based on rendering window size, because of the way shadows are currently generated (Perhaps could we think about a "render-to-texture" shadow mode (if hardware supports it) that would allow way bigger maps). So one easy way to improve shadows is to run the application fullscreen. About the line 101 in shadow.c, I must admit that I can't remember why it's here :/ Probably some performance issue during shadow system development ? I'll make a few tests and probably remove this "reducing factor" so the shadow map size will match (closest power of two) window size, shadows will be 2 times more accurate. Can you confirm it works for you with "raydium_shadow_map_size=tmp" ?